As a pioneer of prefabricated designed printing presses, this press was our first design. Simple honest construction, now tried and tested. 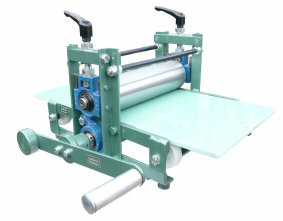 This press provides the same bed and bearings as all the other bench models,it also provides a cheaper geared bench model for schools as well as the private artist. Fitted as standard an easy to use one- handed crank handle.A four spoke starwheel option can be offered for £70 extra. Now fitted with Easi- set handles makes setting up much easier and larger bed support rollers.Holes are provided in the feet for fastening to a bench or table.Colour choice see Information Page. A honest press capable of good work.